(WJD) Israel's economy produces computer chips, software, and innovation. In the Gaza Strip, terror is the main export. 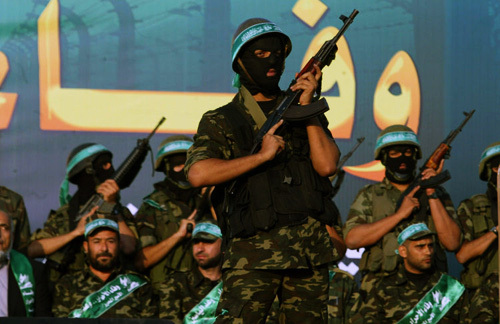 Khaled Abu Toameh reports that Islamist groups based in the Hamas-controlled Gaza Strip have lately begun exporting terrorists to Syria, where they are joining other radical Muslim groups to topple Bashar al-Assad. The ultimate goal, Abu Toameh writes, is to turn their arms on Israel once the Syrian conflict is completed. "Dozens" of Palestinians have joined the radical Islamist group Jabhat al-Nusra, designated as a terrorist organization by the United States and blamed for massacres of civilians in Syria. Though Hamas is threatened by these even more radical groups operating in the Gaza Strip, they have not stopped them from funneling men to Syria. Abu Toameh warns that this is a negative trend for Israel and the world.